Understanding where animals move is crucial to wildlife conservation. For example, in order to effectively conserve a species, we need to know where individuals overwinter, if they move to different habitats for the summer, how far they move from overwintering habitat, if they need multiple habitats during summer, and so forth. If a species requires multiple habitat types during the year, these habitats all need to be protected if the species is to persist long-term. For example, protecting only overwintering habitat provides some level of benefit for a species’ conservation but will not be as effective as protecting both overwintering and summer habitat. Answering questions of where and how far animals move may seem like simple questions, but answering them for wild, free-ranging animals can be very challenging. transmitter into the snake’s body cavity. will then be threaded through the tube. Fortunately, modern technology has provided herpetologists (and wildlife biologists in general) with a solution: radio telemetry. Radio telemetry is a technique whereby a radio transmitter generating a radio signal at a unique frequency is attached to an animal and a researcher uses an antenna and receiver to locate that transmitter. Radio telemetry is a powerful tool because researchers can locate (or try to locate) an animal whenever they want, night or day, rain or shine. An animal might be underground or in very thick vegetation, yet a researcher can still determine the location of that animal fitted with a radio transmitter. As radio telemetry has become more widespread and used on a greater variety of species, researchers have gained a better understanding of where and how species move across the landscape. Radio telemetry has been used to study the movement patterns of snakes since the late 70s and early 80s and has been critical in our understanding of many aspects of snake ecology. But how would a researcher attach a transmitter to a snake? Mammal biologists typically use radio collars (a transmitter attached to an adjustable leather or plastic collar) that can easily be fit around the neck of a deer, moose, wolf, or bear, but collars wouldn’t fit well on the snakes. The standard procedure for attaching a radio transmitter to a snake is to actually surgically implant the transmitter into the body cavity of the snake. This approach has been used since biologists first started studying snakes with radio transmitters and has become quite standard. Modern radio transmitters used with snakes are typically 5-15 grams (0.17-0.53 ounces) and have a cylindrical body with an 8-12 inch flexible wire antenna on one end. This antenna helps better broadcast the radio signal. Biologists try to use the smallest transmitters possible to minimize their impacts on the snake’s behavior. When done properly, a surgically-implanted transmitter has very little effect on the snake’s health and behavior. I was able to witness this procedure firsthand when I delivered an Eastern Indigo Snake from our study in Highlands County, Florida, to the University of Florida’s Small Animal Hospital to receive a surgically implanted radio transmitter. 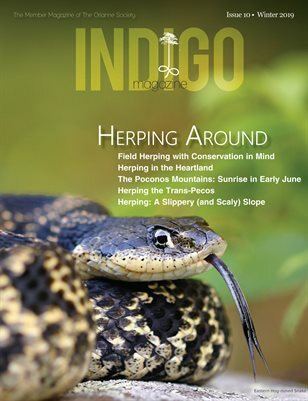 We have our surgeries performed at the hospital to ensure that the Indigo Snakes are operated on by some of the most capable reptile veterinarians in the world. After checking the snake in, just as a person would check in for surgery, I bring the snake to the back operating room. The snake’s length is measured and a technician marks off a point two-thirds of the distance from the head for the incision site. The surgical team then begins the process of anesthetizing the snake. The snake will receive a general anesthesia, just as a human would for a major surgical procedure. We first place the head of the snake inside a tube that is connected to the anesthesia machine, which administers a mixture of anesthesia and oxygen, allowing a technician to control the flow and the mixture of the gas. Once the snake has become sedated, a tube is placed down the snake’s windpipe to maintain the snake on anesthesia during the surgery. After about 30-45 minutes, the snake becomes fully anesthetized and the surgery begins. The veterinarian makes a one-inch incision along the side of the snake. All of the surgical tools, as well as the radio transmitter, have been gas-sterilized to reduce the risk of infection. Using a pair of forceps, a small tear is then made in the thin membrane that surrounds the body cavity. The transmitter is placed through this tear so that the main body of the transmitter is entirely within the snake’s body cavity. However, the 10-inch antenna will be placed under the skin of the snake. Researchers in the early 1980’s developed an innovative technique for inserting the transmitter under the skin of a snake. A thin, hollow metal tube is slid under the skin toward the head of the snake, then pushed through the skin. The antenna is then slid through this tube, and the tube is pulled out through the second hole in the skin. This ensures that the antenna is stretched out completely, underneath the skin. Once the transmitter is in place, the technician shuts off the flow of anesthesia so that the snake can begin to receive oxygen and start to recover. During this time, the veterinarian sutures the incision closed. We do not remove the sutures; they will fall out on their own the next time the snake sheds its skin. Within an hour or so, the snake begins to move, indicating that the anesthesia has worn off. The snake is held overnight at the Hospital to ensure that the anesthesia has worn off completely before being transported back to Highlands County. Since the surgery was conducted in the late spring, we released the snake after it spent another night at the Archbold Biological Station. The Highlands County temperatures are warm enough in May so that the snake can find a warm refuge in which to heal. If the surgery were to be conducted in the winter, we would hold the snake in captivity for several days to give the snake the warmth it needs for the incision to begin to heal. The battery in this radio transmitter we had implanted will last for about two years. At the end of the season, we will capture the snake to have its transmitter removed. Because a surgery is a major procedure for a snake to undergo, we only use radio telemetry when mandated to answer a specific question in on-the-ground conservation efforts. Whenever The Orianne Society uses radio telemetry, we always ensure that the best and most up-to-date surgical practices are used to minimize stress on our snakes. By using careful surgical procedures, radio telemetry has allowed researchers, including those of us at The Orianne Society, to make important strides in our understanding of snake ecology.